Goodreads says, "THE OTHER ME spans from 1930s Germany to 1990s England as Saskia Sarginson explores whether our identities are tied to where we came from, and if it's possible that sometimes history doesn't get the story right. 1986, London - Klaudia is about to start high school. She's embarrassed by her German father, never knowing what he may or may not have done during the war. In 1995 Leeds, Eliza is a young woman in love - with her life as a dance student, and with her boyfriend Cosmo. But Eliza is living a lie, running away from a past of which she was always ashamed. But when her mother dies and she is called home, she can no longer deny her roots, even if it will cost her everything. And woven throughout the novel is Ernst's story - Ernst is one of two brothers growing up in Nazi Germany. One rallied for the Fuhrer, one held back. One dedicated his life to the Nazi regime, one did not. When Eliza learns a long-buried family secret, it will completely change how she views her past and her future. By exploring identity, memory, and history, Saskia Sarginson deftly shows that it is the people we think we know the best who sometimes surprise us the most." Klaudia Meyer is a shy homeschooled girl living in 1980s London. It's her first year of high school (and real school! ), so she's a bit nervous, especially since her father works at the school as the caretaker. Klaudia's childhood has been anything but normal. Her parents are strict, religious, and she hasn't really interacted with other young adults. She loves to dance and has always dreamed of taking dance lessons, but her parents say they can't afford it. While at high school, she realizes that the other kids make fun of her father since he has a German accent and Klaudia comes to realize that he fought for the Nazis during WWII. This has brought much shame to her, especially when her classmates find out that he's her father. Then there's Eliza living in the 1990s in Leeds, England. She's a dance student and seems to have her whole life in front of her: a steady boyfriend, a best friend, and she's following her dream of becoming a professional dancer. But there's one problem. Her life is built on a lie and what happens when people find out the truth? Will her walls come crashing down? Lastly, there's Ernst living in Nazi German during WWII. All he has got is his brother as he is adopted and his family treats both boys horribly. Now that Hitler has taken over, things get more complicated. Ernst's brother is all for Hitler, but Ernst is hesitating. Is this the path he really wants to take? 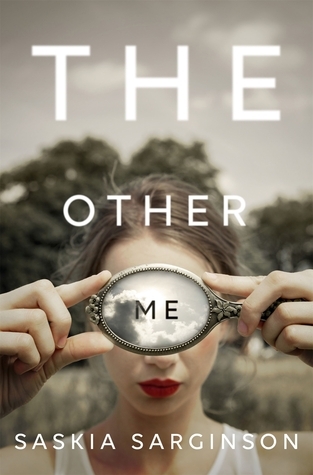 Saskia Sarginson weaves a tale that at first seems disjointed, but as readers gain more information, the picture gets clearer and things start to make sense in The Other Me. There's something here for everyone: a coming-of-age story, a historical story, a romance, and a family drama. At first I was really drawn to Klaudia's coming-of-age story. I truly felt for her, because she has been so sheltered. I wanted her to branch out and live life now that she was in a real high school, but things weren't easy for her. At all. Her father is pretty much the reason why things don't go swimmingly, but also she isn't very forthcoming. This trait stays with her throughout The Other Me; Klaudia has a tendency to omit the truth and this mistake will haunt her. Also, it broke my heart to see Klaudia bullied just because her father is German and a former Nazi. She couldn't seem to escape this one fact. Eliza is very similar to Klaudia in that they both hide the truth from their friends; instead of being honest about their situations, they sort of gloss it over to keep up appearances. Eliza is better at this than Klaudia as she has built her whole world up on this one lie. But what happens when she meets the boy of her dreams? She can't continue to lie to him or can she? Ernst's story was also interesting in The Other Me. I loved the historical details and how his sub plot really made me think. He had to choose between his country, his brother, and his heart. War is not easy on anyone and I think it was interesting to see how someone on the "other side" (the Nazis) might struggle, which we often don't see in literature. I was really skeptical regarding the simple of fact of how will these three very different people will come together to create a full picture, but Sarginson pulled it off very well. She switched from point of view to point of view expertly and slowly the truth unraveled in The Other Me. Be forewarned, The Other Me can be a little depressing and sad at times, but I think it was a smart read and one that made me think about history and the truth regarding our own ancestry. This type of historical fiction is so interesting to me; where facets of stories intersect to create a cohesive tale. You've convinced me! I hope you can pick up a copy! Thanks for visiting, Joy! I've been interested in hearing more about this one, Christina; it sounds good! Thanks so much for sharing your thoughts!! I think you'd like it, Tara! Thanks for dropping by! I just placed this one on hold at my library after reading your review! It sounds really great and I love that it takes on the different perspectives and time settings! Awesome, Becky! I can't wait to hear your thoughts. I hope you enjoy it...although it is a bit depressing at times...just a warning! Thanks for visiting! I love history and reading books set in WWII especially so that part appeals to me. I've read some spoilery reviews of this one unfortunately though maybe they are things that are revealed up front in the book. Nice review. I may suggest this to my book groups. I think it would work nicely for a book group. I did like the WWII aspect and how the author merged the different time periods. Thanks for visiting, Christina! I've been curious about this one for awhile because the cover is so striking. I might save this for when I'm in a darker mood, though. Great review! I love the cover, too! Definitely save it for a darker mood...I think you'll like it, Natalie! Thanks for visiting.